Over the past month, Research Consulting has been undertaking a review of UK higher education institutions’ progress towards implementation of the open access policy for a post-2014 Research Excellence Framework (REF). Based on the six institutional workshops, completed with the support of the Jisc Open Access Good Practice Pathfinder projects, as well as interviews with Jisc and HEFCE staff, the study has identified how much progress has been made across the sector to implement the policy and distinguished where there may be further opportunities to support institutions in this area. 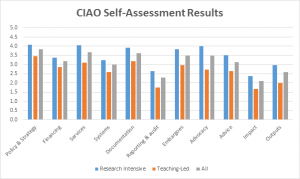 The Collaborative Institutional Assessment of Open access (CIAO) tool was used to gauge institutions’ current level of readiness of the REF policy. 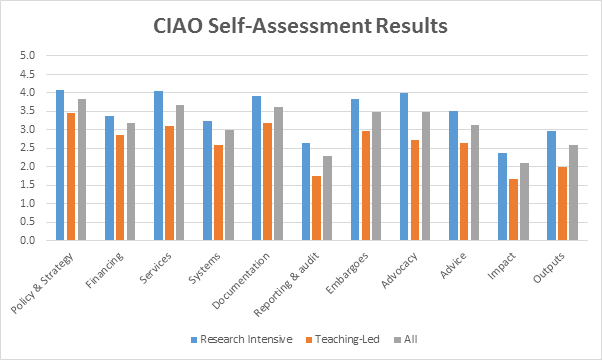 Based on responses from 37 participating institutions, summarised below, the study found that, whilst all institutions were actively pursuing implementation of the REF open access policy, research-intensive institutions were generally found to have more developed open access capabilities than teaching-led institutions. •	Systems deficiencies which may result in significant compliance issues. •	A tendency towards ‘gold-plating’ of processes and uncertainty over audit requirements which could be alleviated through reliance on institutional internal audit functions. •	The added value of self-archiving where articles are made OA through the gold route appears limited relative to the effort involved. •	The SHERPA/REF tool, in development, could save time and promote greater author engagement with the policy, if the results delivered were formally endorsed by HEFCE. Resourcing also presented a further challenge for institutions, due to a rapid rise in deposits and potential inefficiencies in current processes. A large number of less significant issues were also raised, including difficulties in securing and identifying the AAM, uncertainties over dates of acceptance and publication, and concerns over staff recruitment and retention. There are a range of existing Jisc projects and services with the potential to address some of the issues identified. The most important are considered to be the SHERPA services, Publications Router and the RIOXX/CASRAI projects, but institutions also see scope for ORCID, IRUS-UK, Jisc Collections and CORE to support REF compliance. 1. Jisc should review its arrangements for supporting institutional repositories, in view of the concerns identified over usability, required levels of technical support and uncertainty over how some specialist institutions can achieve compliance with the REF OA policy. 2. A comprehensive picture of the current research information system (CRIS) and repository solutions in use by UK HEIs, and the interactions between them, should be developed in order to effectively inform planning of Jisc projects and services. 3. Jisc should actively develop relationships with the major CRIS vendors, to ensure the sector’s requirements in respect of the REF OA policy are clearly understood and reflected in supplier roadmaps. 4. A working group should be convened to explore the role of subject repositories, and consider what opportunities exist to enable REF-compliant deposit in these repositories, with metadata subsequently shared with institutions. 5. Jisc should explore opportunities to collect and share relevant data on compliance with the REF OA policy, for example through further development of the CORE service. 6. The OA Pathfinder programme should take these recommendations into account, and seek to develop and disseminate good practice in the management of exceptions, among other areas. Jisc is committed to supporting the sector in their implementation of the policy and to focus its efforts and resource on those areas recommended by this study. Over the coming weeks, therefore, Jisc will be considering how its projects/ services can potentially be refocused/ reallocated to address the most urgent issues faced by institutions and will release details of these plans as soon as they become available. Posted by Neil Jacobs on June 2, 2015 in Uncategorized. Thanks for this summary Neil. Some of the challenges sound very familiar to what we are hearing from HEIs around their compliance with research data policy requirements as well.